ACOUSTIC WEEK By the very nature of its name, rock music would not normally be associated with the acoustic guitar. But many of the most famous electric players were at one time influenced by the likes of Robert Johnson and Elvis Presley, both of whom played acoustic instruments. 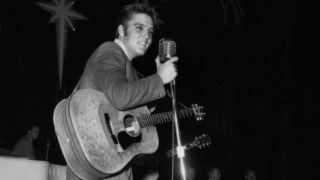 Elvis, in particular, must have given the acoustic guitar a lot of street credibility after causing outrage with his 'sexual' guitar and hips displays on American national TV during the 1950s. Eric Clapton, when in Cream, was probably one of the first rock guitar heroes to use an acoustic. It was on a single called Anyone For Tennis, recorded during the Wheels Of Fire sessions in 1968. Eric played a Guild F-50 on the session, and he also appeared on American television playing the acoustic while miming to the song's backing track. Jimi Hendrix, possibly the most worshipped of all the electric guitar heroes, also turned to the acoustic when he performed a sublime version of Hear My Train A Comin' for a 1968 documentary about him titled Experience. Away from the left-handed Strats and Marshall amps, it showed the world that he could reach out to people just as well on an acoustic as he could on electric. One can only imagine what unexpected delights a Hendrix unplugged set would have brought. Pete Townshend composed a lot of The Who's material on an acoustic during the 1960s and 1970s. The Rolling Stones were also early users of acoustics in the world of rock. Keith Richards' acoustic work and sincere lyrics on the classic Beggars Banquet album, still stand up today. Keith's gritty, yet beautiful, acoustic country- blues numbers, Dear Doctor, Prodigal Son, No Expectations and Factory Girl, have all helped make Beggars one of their best albums ever. It is also interesting to note that Keith was using an acoustic guitar on Parachute Woman, recorded via a cassette recorder to get suitable distortion. Pink Floyd's David Gilmour also experimented with acoustics, particularly on the band's album, Ummagumma. Jimmy Page is yet another rock guitarist who occasionally turns to the acoustic. It was after forming Led Zeppelin, that his reputation as an awesome guitarist really gathered momentum. The band's third album, Led Zeppelin III, found Page delving into a mellow acoustic groove. The album boasted the graceful beauty of That's The Way, some raw, earthy charm in Bron-Y-Aur Stomp, and Hats Off (To Roy Harper), and the folk driven traditional Gallows Pole. The highlight of Led Zeppelin III for many, though, is Tangerine, a song about pure love. It was actually a Yardbirds leftover, originally titled Knowing That I'm Losing You, and was just one of several songs Page had been working on with The Yardbirds in the spring of 1968. It was with Led Zeppelin III that Page successfully introduced acoustic styles to rock and paved the way for other bands to follow. It was with Led Zeppelin III that Page successfully introduced acoustic styles to rock and paved the way for other bands to follow. Their next album, unimaginatively named Led Zeppelin IV, also had its fair share of acoustic based numbers including the now legendary Stairway To Heaven. The song successfully blended acoustic and electric guitar on an epic scale. The acoustic intro was played on Page's stock Martin D28. The album also featured more acoustic material on Goin' To California and The Battle Of Evermore, which also boasted some haunting vocals from Sandy Denny. Nils Lofgren also made his presence felt in the 1970s with his acoustic harmonic ideas, dropped-D tuning, and rhythm licks. He later joined Bruce Springsteen's E-Street Band. The Eagles were another band to successfully blend acoustic and electric guitars, most notably on their 1976 classic, Hotel California, and their electric-acoustic style is still popular. Led Zeppelin, The Eagles and The Stones had a huge influence on the next generation of rock guitar players including Richie Sambora, who fingerpicked an acoustic on Bon Jovi's Wanted Dead Or Alive. Slash, the Guns N' Roses axeman, also used acoustics extensively on Patience and other songs on their 1988 album, G N'R Lies. And Extreme's Nuno Bettencourt played an acoustic guitar on More Than Words and Hole Hearted. Zakk Wylde, Ozzy Osbourne's guitarist, is just one of the latest generation of rock guitarists who use acoustics. In 1996, he released Book Of Shadows, an acoustic-based album that showcased his songwriting skills. In 1999, he returned to heavier rock with a new band, Black Label Society, but the group's first release, Sonic Brew, still featured a lot of acoustic material alongside the quota of bone-crunching metal riffs. The most notable 'mainstream' act to heavily feature original acoustic material on their albums in recent years is undoubtedly Coldplay. Trouble and Yellow, two of the band's most popular acoustic songs, have brought Coldplay considerable success and admiration on both sides of the Atlantic. Most recently, Noel Gallagher's High Flying Birds have proved you can top the charts and sell out arenas with a rock band fronted by an acoustic slinging frontman. Rolling Stones release Let It Bleed which features several acoustic numbers.